Metropolitan areas may suffer with increase of air pollution due to the growth of urbanization, transportation, and industrial sectors. The Metropolitan Area of Vitória (MAV) in Brazil is facing air pollution problems, especially because of the urbanization of past years and of having many industries inside the metropolitan area. Developing air quality system is crucial to understand the air pollution mechanism over these areas. However, having a good input dataset for applying on photochemical models is hard and requires quite of research. One input file for air quality modeling which can play a key role on results is the lateral boundary conditions (LBC). 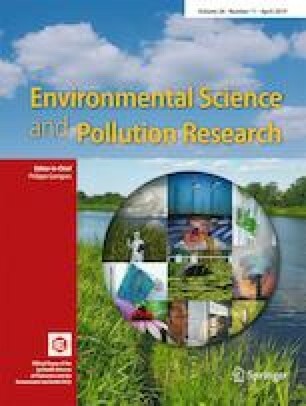 This study aimed to investigate the influence of LBC over CMAQ simulation for particulate matter and ozone over MAV by applying four different methods as LBC during August 2010. The first scenario (M1) is based on a fixed, time-independent boundary conditions with zero concentrations for all pollutants; the second scenario (M2) used a fixed, time-independent concentration values, with average values from local monitoring stations; the third CMAQ nesting scenario (M3) used the nested boundary conditions varying with time from a previous simulation with CMAQ over a larger modeling domain, centered on MAV; and finally, the fourth GEOS-Chem scenario (M4) used the boundary conditions varying with time from simulations of global model GEOS-Chem. All scenarios runs are based on the same meteorology conditions and pollutant emissions. The air quality simulations were made over a domain 61 × 79 km centered on coordinates − 20.25° S, − 40.28° W with a resolution of 1 km. The results were evaluated with the measured data from the local monitoring stations. Overall, significant differences on concentrations and number of chemical species between the LBC scenarios are shown across all LBC scenarios. The M3 and M4 dynamic LBC scenarios showed the best performances over ozone estimates while M1 and M2 had poor performance. Although no LBC scenarios do not seem to have a great influence on total PM10 and PM2.5 concentrations, individual PM2.5 species like Na, NO3−, and NH4+concentrations are influenced by the dynamic LBC approach, since those hourly individual PM2.5 species from CMAQ nesting approach (M3) and GEOS-Chem model (M4) were used as an input to LBC. The authors thank CAPES and FAPESB for the financial support of this work. We extend our thanks to the NQualiAr lab at UFES, which provided the computational infrastructure, the Research Group of University of Florida for the support with Geos-Chem, and IEMA for providing the emissions inventory and data from RAMQAr. Part of this research was also supported by the National Strategic Project-Fine particle of the National Research Foundation of Korea (NRF) funded by the Ministry of Science and ICT(MSIT), the Ministry of Environment (ME), and the Ministry of Health and Welfare (MOHW) (NRF-2017M3D8A1092022).